The good news is that my daughter’s teachers are at last beginning to use computers. The bad news is they are using them to make PowerPoint presentations. Frightening images of my high school algebra teacher with the indelible blue arm from the ceaseless writing and erasing at the overhead projector flashed through my mind during my recent trip to Back-to-School Night. Monotonous lectures at the overhead are quickly being replaced by the even more mind-numbing PowerPoint-based instruction. While the overhead projector allows a presenter to make changes and annotations on the fly in response to the needs of the audience, a PowerPoint presentation is a fossil created earlier that day — or during another school year — with low expectations for audience engagement. Allow me to set the scene, a drama familiar to parents of secondary school students. 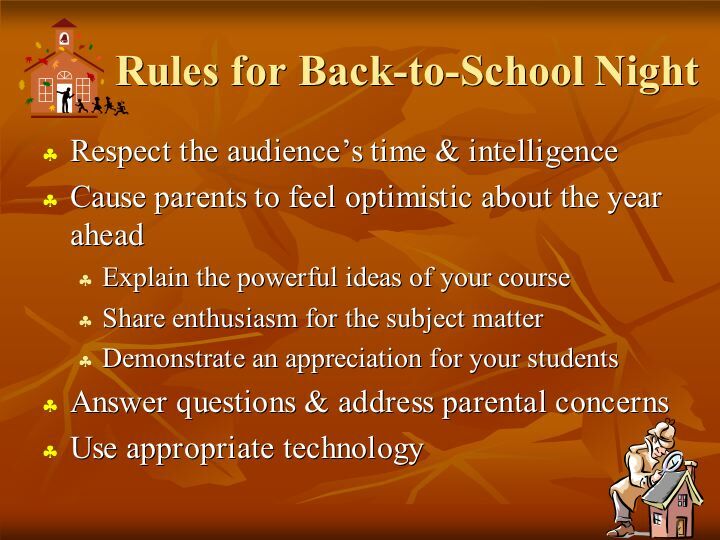 Your child writes his or her daily school schedule for you to dutifully follow during Back-to-School Night. You rush through dinner to attend the PTA meeting, where the details of the latest fundraiser can be revealed. This year you will be inflicting $20 gallon drums of cookie dough on your innocent friends, colleagues and relatives. Next, you run a half-marathon in less than three minutes on a pitch-dark campus in order to make it to your first-period class. The teacher, a new devotee of PowerPoint, has a problem to solve. The low-bid PC in her classroom is broken and the school district cannot afford an expensive data projector for every teacher. Undeterred by these challenges and buoyed by a motivation to convey critical information to the assembled parents, the teacher does what any good problem solver would do. She prints out the PowerPoint presentation. The teacher carefully hands each parent a copy of her presentation one at a time. This takes approximately four minutes (and uses all of the toner in the hemisphere). The title page contains her name and contact information, but no details about this particular class because the presentation needs to be generic enough to use all evening. Upon opening the stapled packet one is treated to a couple of dozen slides detailing the teacher’s gum rules, incomprehensible grading system and ways in which students will be punished for breaking any of the innumerable classroom rules. Since the “presentation” was prepared with a standard PowerPoint template, each page is dark and the school will be out of toner for the remainder of the year. Teachers like the one I describe are well-meaning, but their reliance on PowerPoint undermines their ability to communicate effectively. Such presentations convey little information and reduce the humanity of the presenter through the recitation of decontextualized bullet points. Such presentations require expensive hardware, time-consuming preparation and reduce spontaneity. This eight-minute presentation was a test of endurance. I fear for students subjected to years of teacher-led presentations. As a service to educators everywhere, I have prepared a one-slide PowerPoint presentation (above) to help them with Back-to-School night. Somehow the making of PowerPoint presentations has become the ultimate use of computers in American classrooms. Perhaps we are emotionally drawn to children making sales pitches. Adults see these children playing Donald Trump dress-up and overvalue the exercise as educational. Teachers refer to “doing PowerPoint” or students “making a PowerPoint” and this is unquestionably accepted as worthwhile. The desire to create a generation of fifth graders with terrific secretarial skills fails on a number of levels. PowerPoint presentations frequently undermine effective communication. The time spent creating PowerPoint presentations reduces opportunities to develop important storytelling, oral communication and persuasive skills. The corporate look of PowerPoint creates an air of false complexity when students are really constrained by rigid canned templates and the use of clip-art. Class size and time constraints frequently deprive students of opportunities to actually make their presentations before an audience. Kids should be conducting authentic research, writing original ideas and learning to communicate in a variety of modalities. PowerPoint is a poor use of technology and trivializes the development of communication skills. Don’t Pee on My Leg and Call it Science! Chelsey Drummer on Don’t Pee on My Leg and Call it Science! Bet on Don’t Pee on My Leg and Call it Science! Conn on Don’t Pee on My Leg and Call it Science! Joe D. on Don’t Pee on My Leg and Call it Science!